My first peony bloom of the season just opened. It's a lovely little pink Paeonia mascula. 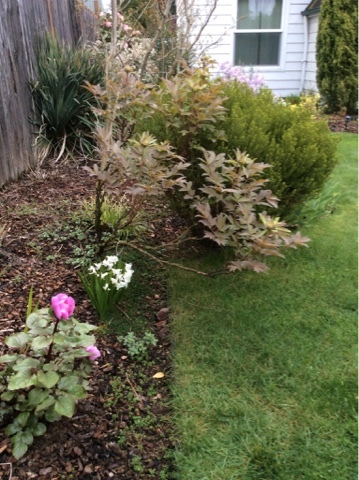 I posted a picture online and I was surprised how much disbelief there was that I could possibly have a peony blooming so soon in Portland, Oregon. The pics in this post are all from this week. 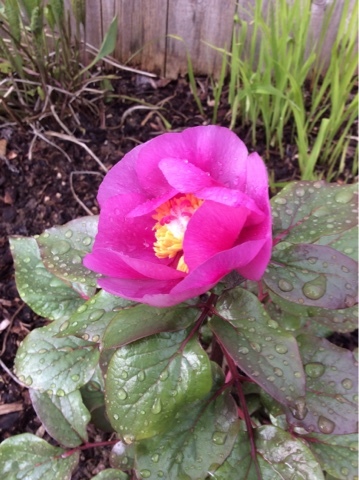 Paeonia mascula is always the first peony to bloom for me - always in March. The purpose of this post is show how different peonies can be, at least in my garden. There are a lot of factors influencing peony growth and bloom time. I admit that I have a few more peonies than the usual Portland gardener might have, so there is a lot happening peony-wise in the garden right now. 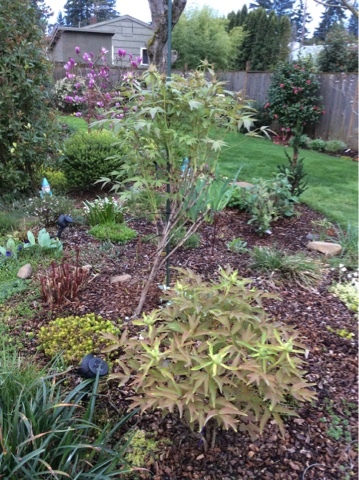 At The Lents Farmer, the woody tree peonies (Paeonia suffruticosa), begin leafing out in February and generally bloom the end of April/early May. I often find their desire for early arrival to be frightening, as I worry that cold weather, frost or snow will get them. With their origins in China, cold weather doesn't seem to phase them. 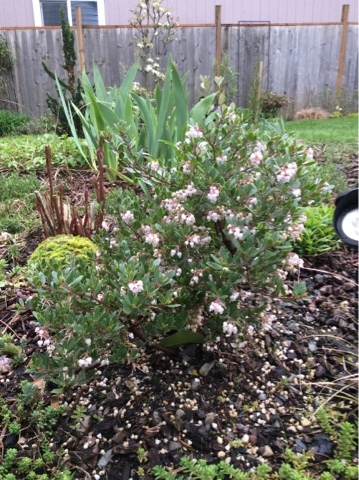 It's still a nail biter for me when Portland weather shifts around drastically in spring. 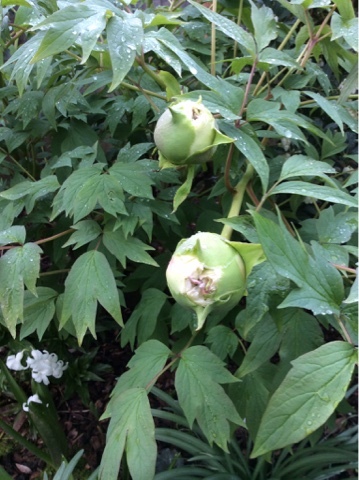 Herbaceous peonies (Paeonia lactiflora), begin emerging in February. 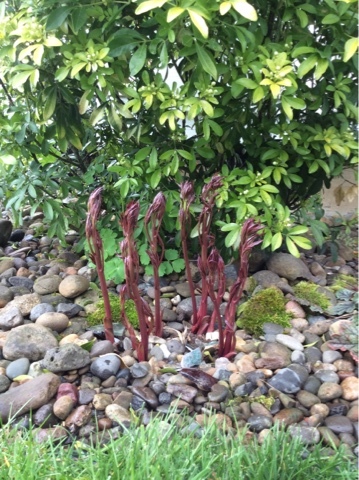 Their red shoots start pushing up the mulch and they start popping out of the ground. There is a huge disparity among their growth rates. 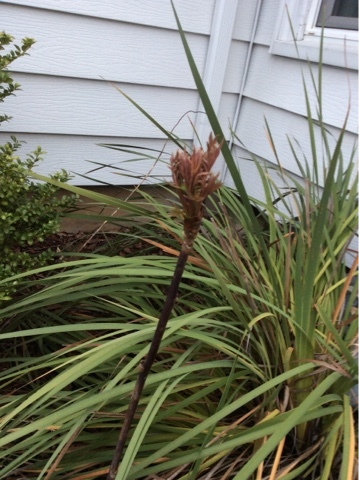 I have some varieties that are now 15" tall with buds clearly visible and some that are barely out of the ground. I assume these differences are varietal and also a little bit location. 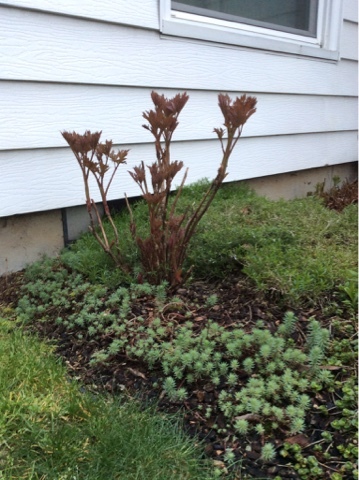 Some peonies emerge with little buds hidden in the center, and others wait until later when the weather is warmer to produce buds. So, there are early, mid and late blooming herbaceous peonies. I always think of the herbaceous peonies as about a month behind the tree peonies for bloom time. 7 different Herbaceous Peonies in the middle of the strip. Several of the Herbaceous varieties have gorgeous burgundy stems unfurling. 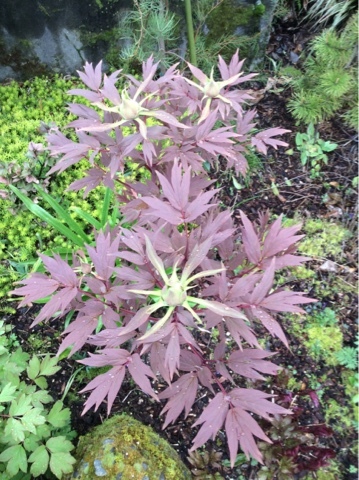 Itoh, or Intersectional Peonies, are a cross between Tree and Herbaceous. I only have two Itoh, one of which I just bought in 2016. They seem to act like a Herbaceous so far. 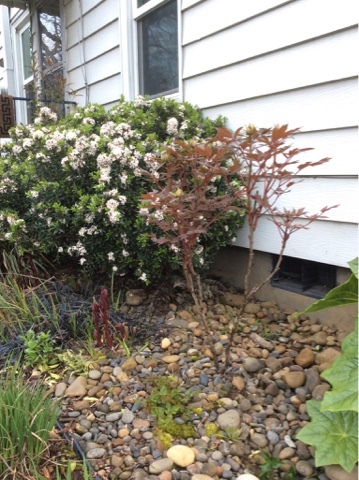 Stake (or re-stake) the peonies that need support. Remove dead stems from peonies. Keep my rambunctious Assistant, Yvette, from breaking all of them. 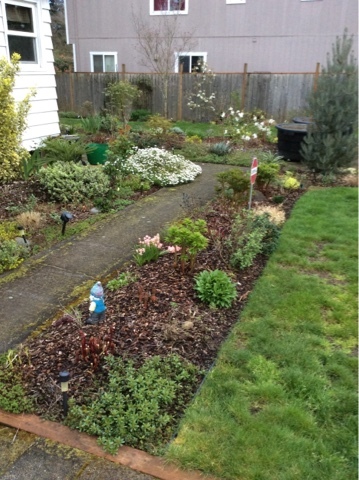 Your garden is always nice, but I bet it will be absolutely magical at the end of April. I only have one peony and it's a yellow one - P. mlokosewitchii, or Molly the Witch. Haven't seen it bloom yet, but the leaves are pretty! I don't think most people are that familiar with the variety of peonies. I grow half a dozen woodland and species Peonies that bloom in April in Wisconsin. I'm from Madison. My mother was a gardener, but only had a handful of peonies. 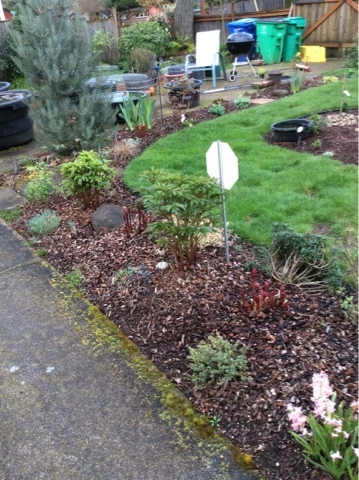 What I love about Portland vs Madison is that we can grow so many more things here. Wonderful, wonderful--really enjoyed this. These are very exotic plants to a So Cal native--like Aloes to a PNW-er? hi,where is a good place to buy tree peony??? you had a wonderful correction of them. I'm just sorry I couldn't make it to see these in person when you opened your garden. My neighbor loves herbaceous peonies and grows them between her roses, making for a lovely bloom show when they both flower at the same time. I'll pay special attention to them this year after reading this!